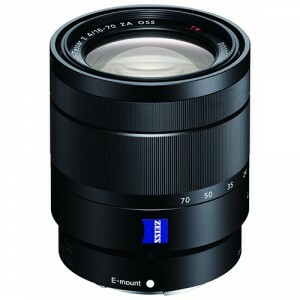 The Sony Vario-Tessar T E 16-70mm f.4 ZA OSS lens is a standard zoom lens for the Sony E (APS-C) mount bodies designed by Carl Zeiss and manufactured to Carl Zeiss specifications. This lens is typically regarded as the best option for APS-C E mount standard zoom lenses, but is a bit controversial due to it’s premium pricing. Many web sites have tested the lens with mixed results, and most users rate the lens very high, so why the discord? Is the lens actually not up to the pricing, or is it a perceived value thing? Read my Sony Vario-Tessar T E 16-70mm F4 ZA OSS Lens Review for more details. This is where the controversy really starts to heat up. Overall the image quality is very good, but for many it might be hard to justify the premium price for the slight improvement over the standard 16-50mm or 18-55mm kit lenses. The lens is definitely better than the kit lenses. What you have to remember when looking at the price is the entire package, not just the image quality. Remember that this lens is a constant f/4 aperture throughout the entire zoom range. The Sony Vario-Tessar T E 16-70mm F4 ZA OSS lens is built to a very high quality and feels very solid in hand. The zoom and focus rings turn smooth with a slight amount of good resistance to them. The lens is not weather sealed, but since there are currently no weather sealed APS-C E mount bodies, this is not a big deal. The lens does not feature a distance scale on the body, but most E-mount cameras can display the focus distance in the viewfinder or rear LCD, which is actually quite handy when focusing manually. The front element does not rotate when zooming or focusing. The lens is remarkably small for a constant f/4 zoom with an extended 16-70mm range. Overall I really like this lens and will likely add it to my camera bag permanently, but the cost is holding me back. At about $1,000 it is a very expensive lens, and when compared directly to the 16-50mm kit lens that came with my A6000, it does not perform that much better. I like the fact that it is a constant f/4 aperture, and I really like the extra 20mm on the long end. Image quality is excellent and the size of the lens is not terribly large. The build quality is excellent as well. the big question of the day, is it worth it? since there are not any other options for a high quality, professional grade lens in the Sony E mount, then you don’t have much choice if that is what you are looking for. But it you are looking for a “wow” lens, this one feels a little over priced. I would like to see it priced closer to around $849-$899. based on 333 user reviews online.